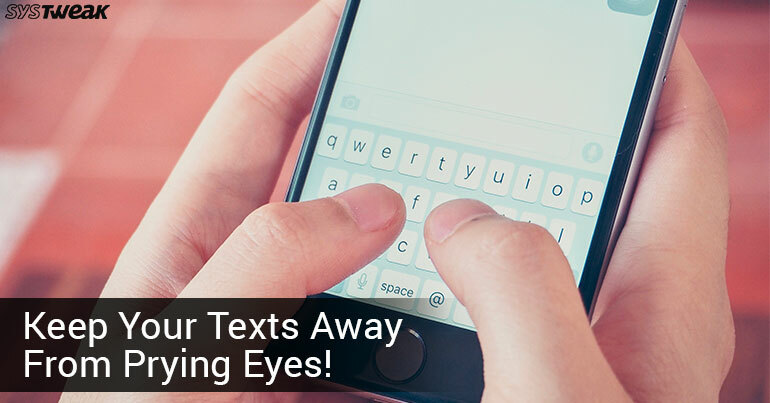 Whether we have anything to hide or not, but when it comes to texting, nobody likes a pair of prying eyes snooping on your phone screen. Also, if you’re constantly worried when your friend borrows your phone we might have a few tips to keep your private conversations safe and secure. It’s really tough to keep your texts away from people and especially if you have kids around then it gets next to impossible. They keep on bothering you and ask for your phone to play games, but what if they mistakenly deleted an important text? Considering all these facts, we have 5 useful tips that can keep your iPhone conversations private and away from audiences reach. This is like avoiding the inevitable! When your phone is lying flat on coffee table or whether its on couch, the lock screen text alerts might get you in trouble especially and catch anybody’s attention on the first place. So, to turn off lock screen notifications on iPhone head on to Settings> Notifications> Messages and then toggle off the “Show on Lock Screen” button. For more privacy you can even disable the text previews from lock screen so that when your phone is locked, your friends or family members won’t be able to read the text in your absence. To do so, leave the toggle switch on for Show on Lock Screen and for Show Previews, choose When Unlocked or Never. By doing this only sender’s name will appear on the lock screen rather than the whole text body being displayed. Yes, we know your phone is barely out of reach. But what in case your kids or curious friends read your text messages on your iPad or Mac? Do you want to put yourself through such a huge risk? If not then you can disable the text message forwarding option from other Apple devices and keep it restricted to just your iPhone. Head to Settings > Messages and see how many Apple devices are listed for Text Message Forwarding. Now toggle off all the devices you no longer want to receive and send texts. Our inbox gets flooded with a lot of texts including ads and promotional messages. So if you don’t want these messages to lay around forever you can opt for automatically deletion of messages. Head on to Settings > Messages and scroll down to the Message History section. Tap on “Keep Messages” and pick either 30 Days or 1 Year. Doing so will automatically delete all the text messages from your iPhone in case you’re too lazy to do it. If a certain company is annoying you way too much with their promotional discounts and offers here’s what you can do to keep your inbox neat and tidy. By adding filters on your inbox you can avoid all unknown numbers from sending you texts. Go to Settings > Messages and toggle on Filter Unknown Senders if you no longer wish to receive alerts from random unknown senders. This is really a great option to prevent people from knowing whether you have read their text or not. When they know the exact time when you read their text, it somehow increases their expectation and wait for your response. So, if you’re one lazy lad and take forever to respond to a text, go to Settings > Messages and toggle off the “Send Read Receipts” option. So folks, here were a few tips to keep your text conversations safe on iPhone. If you have any other queries feel free to hit the comment box. You can also subscribe to our newsletter to get regular tech updates landing right away to your inbox.